Ride on Evolution to the Outer Great Barrier Reef for snorkelling, sun bathing and your choice of either an Introductory dive or Certified dive. Then Get high with a 10 minutes scenic helicopter ride from our exclusive helicopter pontoon before cruising back to Cairns. All aboard or luxury vessel Evolution and speed out to the Outer Great Barrier Reef from Cairns. Enjoy some snorkelling then prepare for your included scuba dive. For First Time Divers; after an in-depth briefing from our expert dive staff, we gear you up and jump in the water for the thrill of a lifetime as we guide you through this amazing wonderland. For Certified Divers; either buddy up with a friend or join our guides as we push the limits and explore the amazing ecology of the reef. 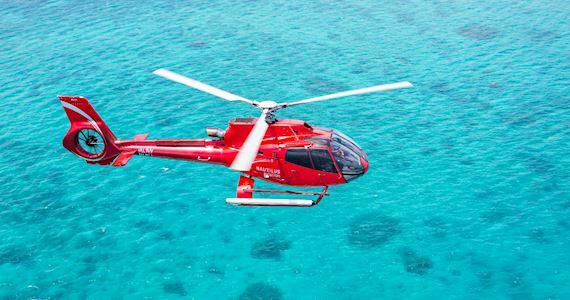 After arriving at Hastings Reef at 1pm, you’ll be briefed then loaded onto one of our state of the art helicopters for an unforgettable 10 minute flight around the reef. Turtles, sharks and even whales can be spotted from up high and you get a feel for the awesome size of this amazing natural wonder. In the afternoon there’s a choice of a ride on our Semi-Submersible tour (weather dependent), more snorkelling or diving, or just laze around on our massive sun-deck. Finally cruise back to Cairns while enjoying our on-board entertainer as he sings and performs his famous didgeridoo show.